Each year the festival presents a five week-long cultural feast from February to March. Runs from January 5th to the end of February each year. 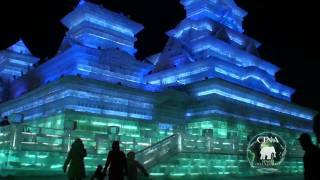 The artistic side of this cultural tradition derives from the making of wind-proof shells for candle-based lanterns using hollowed-out ice blocks. January 5th to mid-February each year. Harbin is the provincial capital of HeiLongJiang. 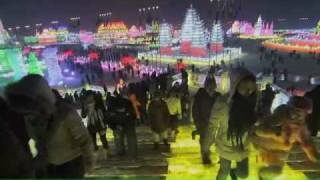 "Every year one of China's most remarkable events takes place in the city of Harbin half way between the North Pole and equator. For five months of the year the mercury rarely hovers above zero. But if you live in Harbin you've got to love winter. 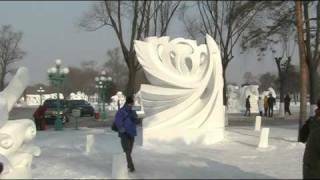 The Harbin Ice and Snow Festival features three of the world's most astonishing attractions - Zhaolin Park the home of ice art, Sun Island the home of the snow expo and Ice and Snow World the biggest winter theme park on the planet. Get an inside look as Harbin's army of workers build a theme park bigger than Disneyland and follow some of the world's best ice and snow carvers in their gruelling quest for gold. This is the opening title sequence from Inside Ice Vegas, produced by Natural History New Zealand Limited and China International Communications Centre for National Geographic Channel." Scenes from the Water Splashing Festival performance (very scaled down winter version). The sprinkling of water on another is a gesture offering a blessing at the time of the New Year and is common in South East Asian countries, including China's Yunnan province - particularly among the Dai ethnic group. 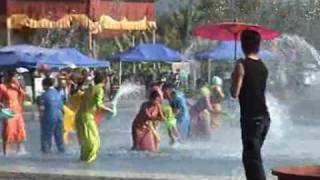 In part, the water symbolises a cleansing of the old, which could bring bad luck in the new year, and the festival usually ends with an exuberant splashing celebration in which it is said that the more drenched one becomes, the more good luck one receives. Harbin is the capital of HeiLongJiang province in north east China. Harbin is quite a large city with a population of around 10 million and is well served by both train and plane. It has some Russian influences in terms of architecture; it has been called the Oriental St. Petersburg. It is a candidate for the 2022 Winter Olympics. Harbin has a wide seasonal temperature variation: from an average minus 18C in January to plus 23C in July. 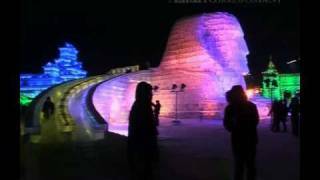 The Harbin International Ice and Snow Sculpture Festival runs every year during January and the beginning of February. The YaBuLi International Ski Resort, the biggest and perhaps best ski resort in China, lies 180 kilometers (110 miles) south east of Harbin. Because of its high elevation (1,000 - 1300 meters, 3,300 - 4500 feet), snow falls for a long period of around 170 days. The period from November to late March is the skiing season here. The resort has high quality snow and has hosted the Winter Asian Games and the 2009 Universiade. It is open all year round with activities such as tennis, hot-air ballooning and paragliding. Home of the Dai ethnic minority. 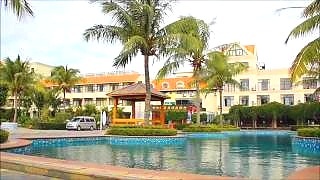 XiShuangBanNa lies at the south of Yunnan province next to the border with Thailand and has a tropical climate. The water splashing is a gesture of blessing - washing away the past and giving new life. An amazing place! However, be warned that with temperatures around -20C in January (daytime), you will need to wrap up very well indeed. It is open annually from approximately 5th January - 5th February; often longer, depending on the weather.